Item is a photograph of Bert Wreford building a model of Old Town. Item is a photograph of the construction of a model of the Dauphin Bastion. Item is a photograph of the model of the Fortress of Louisbourg found in the Louisbourg Museum. The Dauphin Demi-Bastion is in the foreground. Item is a photograph of members of the Department of Mines from Ottawa visiting the Museum. Item is a photograph of the compound area. 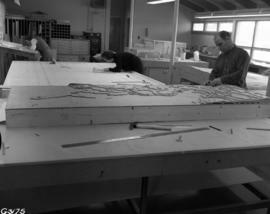 Item is a photograph of Kal Hinrikus building a model. 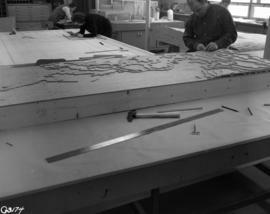 Item is a photograph of Kal Hinrikus building a model of the Fortress area. Item is a photograph of the model of the Fortress of Louisbourg found in the Louisbourg Museum. The King's Bastion is in the foreground. Item is a photograph of the exhibits in the Louisbourg Museum, showing Katharine McLennan's model of the Fortress of Louisbourg. Item is a photograph of the model of the Fortress of Louisbourg found in the Louisbourg Museum, showing the Magasin de Vivres. Item is a photograph of Miss MacIntyre working on a model. Item is a photograph of the model of the Fortress of Louisbourg found in the Louisbourg Museum. Item is a photograph of the model in the Louisbourg Museum.